Abstracts will be accepted until April 15, 2019. Presenters will be notified if their abstracts have been accepted by May 15, 2019. AUCCCD 2019 Conference – Registration Now Open! 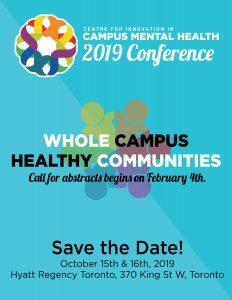 CMHA Conference – Save the Date! CACUSS 2019 – Registration Now Open!